This week in your box: lettuce, spinach or kale or chard, beets or turnips, zucchinis, peas, broccoli, dill or cilantro or basil, radish or kohlrabi, scallions, and arugula. This will probably also be the last week of peas, kohlrabi, and radish. This week on the farm: It’s been hot and we’re noticing how fast things are growing each day. There is one cucumber that is almost ready to pick – we’re trying to decide who gets to eat it. 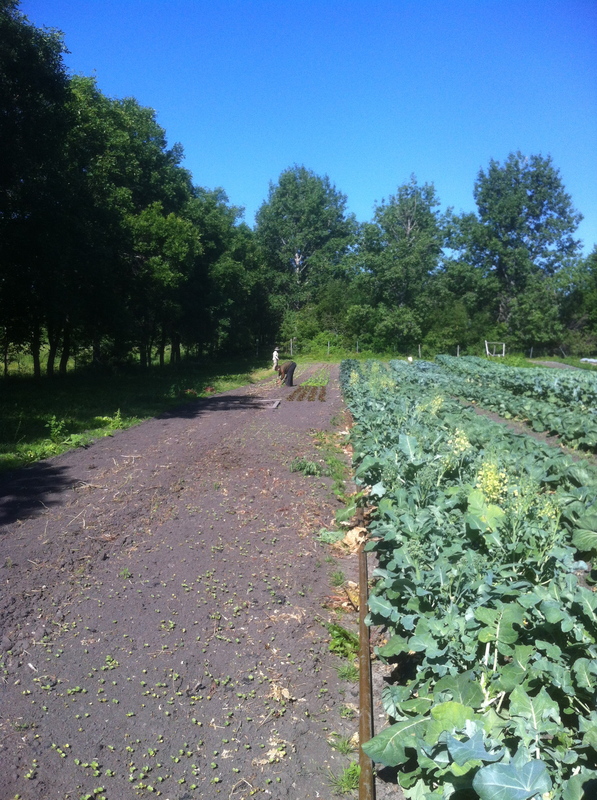 This weekend we also planted the fall cauliflower and the first round of fall broccoli. We’re looking forward to 4 weeks from now when we will be all done planting for the season. In this picture we’re planting lettuce where radish and arugula used to be. Before tilling the radish I tried planting a green manure of buckwheat (which you see coming up) to keep the ground covered until we plant the rest of it to lettuce. Buckwheat is a very fast growing summer crop and good for smothering weeds and cycling phosphorous. Sundays at the Farm: We’re getting to the point in the season where we have extras and are inviting csa members to come out to the farm sundays to pick what is there. Currently, the broccoli will start making lots of side shoots, the older spinach plantings that we are not picking from anymore are still producing lots of nice spinach, and there are too many zuchinnis! So, if you want to come out and stock up for the winter before we till it in, you’re welcome to. The size and quantity of broccoli has been excellent! It’s one of my toddler’s favourite vegetables.